Inscribed front of base: Faunesse; and on right side of base, toward front: 2ème Epreuve. Foundry mark right side of base: F. RUDIER./ FOUNDEUR.PARIS. Auguste Rodin, French, 1840 - 1917. Cast made by F. Rudier, Paris. Found on the left side of the rectangular area above the doors of The Gates of Hell (Philadelphia Museum of Art, F1929-7-128), Kneeling Fauness is one of a large group of half-human, half-animal figures from Greek mythology that Rodin used to explore ideas of unrestrained female sexuality. 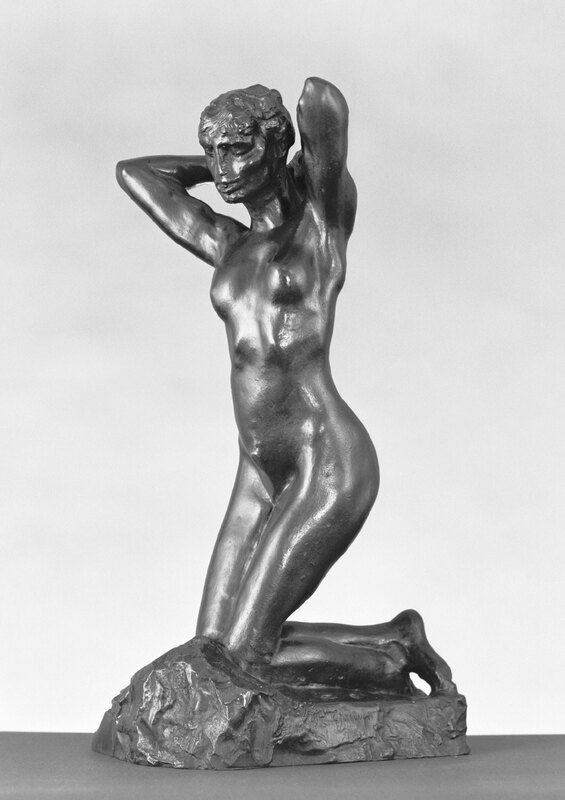 She lacks the goat hindquarters visible in other hybrid figures by Rodin; it is only in her face that she appears not quite fully human.